ANN ARBOR, MICHIGAN – Two youth advocacy groups that are focused on ending gun violence in their communities will be awarded the 2018 Wallenberg Medal from the University of Michigan. The winners of this year’s medal will be The B.R.A.V.E. (Bold Resistance Against Violence Everywhere) Youth Leaders of the Faith Community of St. Sabina from Chicago and March For Our Lives from Parkland, Florida. The medal will be awarded Nov. 14 at 7:30 p.m. in the Rackham Auditorium on the U-M campus, where representatives of the two groups also will deliver the Wallenberg Lecture. This marks the first time the Wallenberg Medal has been conferred on an organization. The honorees will be the youngest recipients in the 26 years the university has made this award. The Wallenberg Medal and Lecture program honors the legacy of U-M graduate Raoul Wallenberg, a Swedish diplomat who saved the lives of tens of thousands of Hungarian Jews near the end of World War II. Ke’Shon Newman and Rie’Onna Holmon will accept the Wallenberg Medal on behalf of B.R.A.V.E. Alex Wind and Sofie Whitney will accept the Medal on behalf of March For Our Lives. Following the medal presentation, they will give the Wallenberg Lecture. 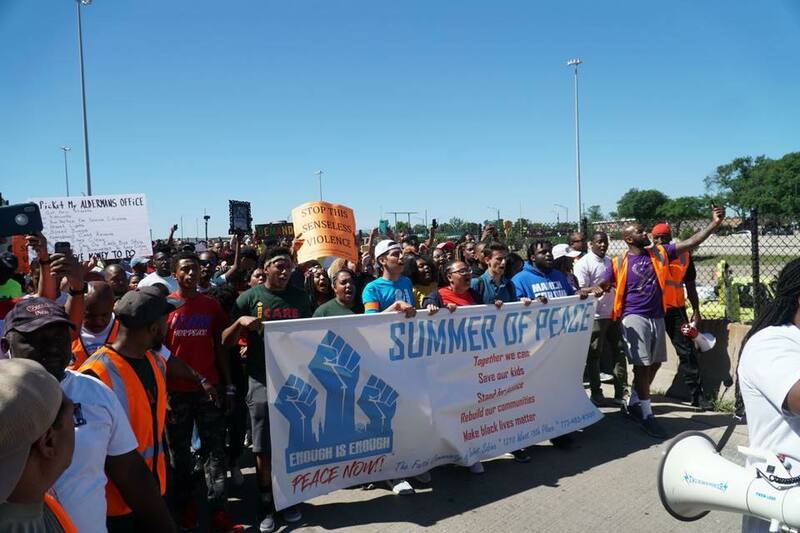 The Brave youth leaders along with Father Pfleger led the march to shut down the 79th Dan Ryan. B.R.A.V.E. is an organization of youth activists sponsored by the faith community of Saint Sabina Church on Chicago’s South Side. The group’s mission is to prevent violence and the cultivate leadership for social justice. Rie’Onna Holmon and Ke’Shon Newman, whose brother was shot and killed while walking his girlfriend home from a bus stop, are both youth ambassadors. March For Our Lives was formed after the Feb. 14 mass shooting at Marjory Stoneman Douglas High School in Parkland, Florida, as a movement dedicated to student-led activism around ending gun violence and the epidemic of mass shootings in schools. Alex Wind and Sofie Whitney are founding members of the organization and leaders committed to serving as voices for those who have been silenced. The Wallenberg Medal and Lecture program honors Raoul Wallenberg, who graduated from U-M’s College of Architecture in 1935. In 1944, at the request of Jewish organizations and the American War Refugee Board, the Swedish Foreign Ministry sent Wallenberg on a rescue mission to Budapest. Over the course of six months, Wallenberg issued thousands of protective passports and placed many thousands of Jews in safe houses throughout the besieged city. He confronted Hungarian and German forces to secure the release of Jews, whom he claimed were under Swedish protection, and saved more than 80,000 lives. U-M awards the Wallenberg Medal annually to those who, through actions and personal commitment, perpetuate Wallenberg’s own extraordinary accomplishments and human values, and demonstrate the capacity of the human spirit to stand up for the helpless, to defend the integrity of the powerless, and to speak out on behalf of the voiceless. The Wallenberg Medalists, through their actions and values, demonstrate that one person, individually or collectively, can make a difference in the struggle for a better world. Last year’s medalist was Bryan Stevenson, a civil rights lawyer, social activist, and founder of the Equal Justice Initiative. Past recipients of the Wallenberg Medal include His Holiness Tenzin Gyatso, Fourteenth Dalai Lama of Tibet; Paul Rusesabagina, a leader in the fight against the Rwandan genocide; and Auschwitz survivor and Nobel laureate Elie Wiesel. A complete list of past recipients, along with videos or transcripts of their lectures, can be found at the Wallenberg website. The Nov. 14 medal presentation and lecture is open to the public at no charge, but tickets will be required for entry. Tickets will be available on October 1 at wallenberg.eventbrite.com.